View of Hiroshima from 33,000 feet (10,058 meters) taken during Mission #141 on April 13, 1945 by Staff Sergeant Darwin L. Hull (August 11, 1916 - May 31, 1984) in F-13A-50-BW 42-24811 of the 3rd Photo Reconnaissance Squadron. This flight of unnamed plane #811, piloted by Lieutenant George J. Benedict (April 19, 1921 - April 17, 1994) and navigated by MacKenzie "Mac" H. Hyman (August 25, 1923 - July 17, 1963) left Depot Field on Guam at 1616 Hours Zebra Time (Greenwich Mean Time, 0216 Guam Time) on April 12, 1945, began climbing to 33,000 feet over the Pacific at 2225 Hours, and made landfall over the coast of Kyushu, Japan at 2334 Hours. #811 proceeded to Kokobu (now part of Kagoshima) at 2345 Hours. The plane appeared over Hiroshima at 0038 (0938 Hours Japan time). Staff Sergeant Hull effected 100% coverage of all primary targets including Hiroshima with little cloud coverage to obscure the city. Hiroshima Prefectural Police noted the approach of a B-29 (actually an F-13A, the photo reconnaissance version of the B-29) at 0938 hours. Yoko Moriwaki (c. 1932 - August 6, 1945), a 13-year-old student at Hiroshima Prefectural Girls High School Number 1, wrote in her diary for April 13, 1945: "Today I saw one of those hated B-29s for the first time. It left a long, beautiful smoke trail, circled once in the sky above Hiroshima and then left. I felt really sad. The air raid signal went off again and we went home at noon." Nobuko Ohshita (c. 1932 - August 6, 1945), also a student at Hiroshima Prefectural Girls High School Number 1, wrote in her diary on April 13, "Today we had another air-raid drill during first period at school. We practiced, doing everything as we had been told yesterday. At the start of the second period, even though no air-raid alert had been issued, B-29s were invading the air over Hiroshima." #811 diverted to Iwo Jima for fuel, landing at 0345 Zebra Time and leaving at 0610. Four and half ours later, the plane landed back at Guam. The film was processed by the 35th Photographic Technical Unit; This unit provided the quantitative reproduction of photographs required by XXI bomber command. It also performed detailed interpretations of the photographs for these units. Strips of film taken by Staff Sergeant Hull were arranged together into an uncontrolled mosaic. An uncontrolled mosaic is formed by joining several overlapping vertical photographs taken at different camera positions. The term is generally applied to an assembly of one or more vertical strips. When the several photographs are oriented with respect to each other, the result is an "uncontrolled mosaic." This provides a good pictorial representation of the ground, but will have errors in scale and azimuth. 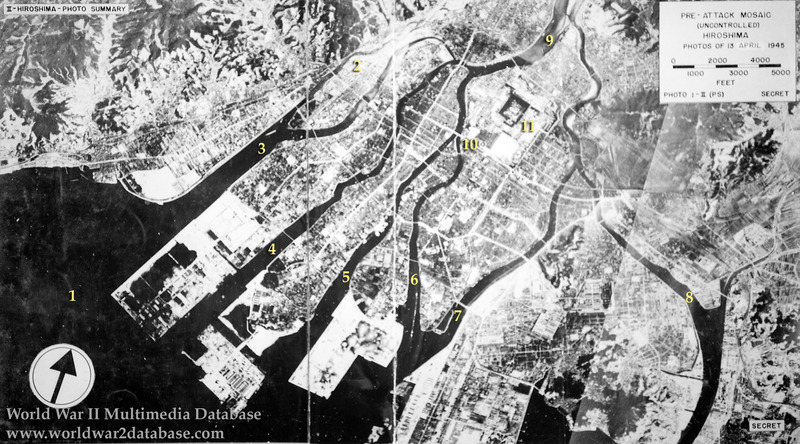 This view shows the rivers of Hiroshima and vibrant life of the city prior to the atomic attack. Areas indicated are 1.) Hiroshima Bay; 2.) Yamate River; 3.) Fukushima River, filled in in the 1960s; 4.) Temma River; 5.) Hon River; 6.) Motoyasu River; 7.) Kyobashi River; 8.) Enko River; 9.) Ota River; 10.) Epicenter of the August 6, 1945, atomic attack; 11.) Hiroshima Castle, constructed in the late 1500s and the Imperial Army Headquarters, reconstructed in 1958. Both Yoko Moriwaki and Nobuko Ohshita perished in the atomic attack, along with 295 other staff and students of Hiroshima Prefectural Girls High School Number 1. Moriwaki was exposed cleaning up debris from houses destroyed as preventative firebreaks in the Dobashi District, about two thirds of a mile (1 kilometer) from the epicenter. Dying, she was taken to the rubble of her school and died that night. Ohshita was also exposed while cleaning debris from firebreaks and was severely burned. She and a friend crossed three rivers before arriving at Koi School, which became a relief station. Ohshita was taken home to Otake, a nearby city, by a relief worker and died there at midnight. This view was included in the United States Strategic Bombing Survey (USSBS) in a report by the Physical Damage Division in May 1947. The Navigator for mission #141, "Mac" Hyman, went on to write the successful book "No Time For Sergeants" satirizing the Air Force. The book was made into a stage play and film starring Andy Griffith. Later a television series of the same name ran for one season in the Fall of 1964. Thanks to Jeff Rohling, 3rd Photo Recon Yahoo Group, B-29 Superfortress Yahoo Group, and the Hiroshima Peace Museum for their assistance researching this photo.